The following article was recently published in Food Shed Planet. Jay Holgate considers himself to have been just a regular guy who went about his business. However, his business is a van-based courier service, and when he saw what happened with gas prices after Hurrican Katrina, he had an "aha" moment at the gas pump. "I was angry at what the gas companies were doing," he told me recently, "and I was shocked to realize how fragile our society really is." Jay, the father of two children, also discovered that Atlanta is number one in the nation in childhood asthma. The city had 47 days of smog alert last year, which means the air quality exceeded both state and federal air quality standards. Yet more and more cars pile onto Atlanta's roads each and every day. Jay was concerned about being part of the problem. "I decided right then and there that we were going to change the way we did business," he said. "I believe we gotta' do the right thing." So Jay's company did a complete overhaul, purchased $100,000 worth of hybrid vehicles and emerged in January 2007 as Green Express, the first courier company in the nation to use hybrid vehicles in its fleet. 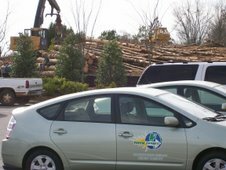 Since then, Jay has aquired 135 new customers, mostly businesses that have made environmental commitments as well. He has converted 92% of his clients to e-billing, reducing his company's paper use by 82%. He has reduced carbon by 34 tons so far this year. And Green Express was just presented with the PACE Innovator Award by the Clean Air Campaign. But Jay Holgate is not stopping there. "We are using the daily routes our drivers already cover to transport recyclables from our clients' offices to recycling locations," Jay explained. "And we are about to launch a healthy snack program for breakrooms where we will set up, stock and replenish alternatives to high-fat, high-sugar snacks. In short, we have expanded our borders for a traditional courier company." And so, I asked Jay how I can use his services. He told me that many of his clients are teleworkers like me and Green Express picks up packages and documents to deliver to home offices and clients every day. What's more, Green Express delivers personal packages as well, for an average cost of about $25 (you can probably get that down to $15 if you can give him a few hours). Need a holiday gift picked up from a store at the mall? Save gas, save time and save your sanity by letting Green Express get it for you, especially during that last week of holiday shopping when UPS doesn't guarantee delivery and you just need that one last gift from the overcrowded, nowhere-to-park mall. I asked Jay if he felt as if he had changed as a result of his Green Express epiphany. He told me, "We started being more conscious of the products we use on our bodies and in the environment. I eat a lot better now. I really care about improving Atlanta's air quality. Once you get aware of these things, then you just continue to grow." Jay's "aha" moment reminds me of 9/12/2001, when I stood there at Publix supermarket, picking out toasted oat cereal and powdered milk for my emergency food kit and wondering about the security of our nation's food supply. And in that moment, I decided to plant my garden, which has since fed my family something every single day for five years now. Jay's "aha" moment reminds me of the surreal conversations we're having here in Atlanta now about this drought situation--there are those who think it's nothing (the majority of people to whom I talk, unfortunately), and those on the other extreme who think Atlanta is going to dry up and become a ghost town and we need to start thinking about hightailing it out of here. Consider that it rained the other night and the level of our main reservoir, Lake Lanier, was down the next morning rather than up (one little rain and my rainbarrel is full again, by the way). I've read reports that say that we need three solid years of above average rainfall to get our water level back to normal. I've read that this winter and next spring are predicted to be dryer and warmer than usual, and that by next summer we will be in a truly catastrophic situation. Federal and state authorities announced yesterday that we have 79 days drinking water left in Lake Lanier. 79 days, folks. This is not a little issue. If my calculations are correct, that takes us to exactly Ground Hog Day--or should I say Ground Dry Day. And that would be precisely when farmers in Georgia would be planting their spring crops. Theoretically. And I want to tell you out there--Atlanta is a lush city in the eastern part of the United States, at the foothills of mountains. If we are having a water crisis, it could happen anywhere. The burning question, of course, is what are we going to do about it? How can we use this as an opportunity to showcase the very best of humanity with innovative solutions that truly work? Click here to find out more about Green Express and the Clean Air Campaign. By the way, I have located only three other couriers that use hybrid vehicles--one in Portland, Oregon; one in Ontario; and one in London. If you know of any others, tell us about them! As for the drought, we're not done with that one yet.